Featherweight boxing veteran Antonio Davis (24-3, 12 KOs) was simply too much for the young southpaw prospect Leon Bobo (16-1, 2 KOs), stopping him at the end of the 5th round on Wednesday night at the Bell Auditorium in Augusta, Georgia. Bobo, 28, was knocked down twice in the 5th round, and was penalized twice for holding, once in the 4th and another time in the 5th round. At the the end of the 5th round, Bobo requested that the fight be stopped due to the amount of punishment he had sustained during the course of the bout. Bobo looked good in the first round, while landing sharp left hands and sweeping right hooks to the head of Davis. However, after the 2nd round, Bobo went into his shell and appeared to wilt under the constant pressure from the 35-year old Davis, who never let up on him for an instant. Most of the action was spent against the ropes, where Davis often had Bobo pinned against while he landed bomb after bomb without stop. In the fourth round, Bobo was penalized for clinching by the referee. By this time, Bobo was showing signs of fatigue and looked as if he couldn’t make it too much further without being stopped. 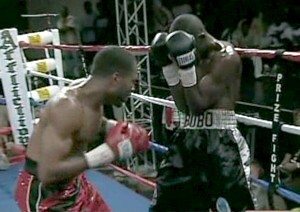 In the fifth round, Davis knocked Bobo through the ropes after landing a flurry of punches. Upon getting back up, Davis unleashed a torrent of punches, ending up with Bobo being knocked down once again. He made it up once again, but against was deducted a point for clinching. Davis continued to pound away at Bobo for the rest of the round, though there were no further knockdowns. After the round ended, Bobo motioned to his corner, saying that he didn’t want to continue fighting. systematically tore apart previously undefeated prospect Leon Bobo (16-1, 2 KOs), stopping him in the 5th round of a scheduled 12-round bout for the vacant WBO NABO featherweight title on Wednesday night at the Bell Auditorium in Augusta, Georgia. Bobo, 28, considered an up and coming prospect, with fast hands and a southpaw style, was simply overwhelmed by Davis’ superior power and pressure, as Bobo was knocked down twice in the 5th round before ultimately quitting after the round had ended. The knockdowns, however, appeared to be more of a case of Davis pushing Bobo to the canvas, but the referee missed it on both occasions. It hardly mattered in the long run, because Davis was pounding Bobo at will from the 2nd round until the 5th. In the first round, Davis, 35, came out strong, pressuring Bobo to the ropes and setting the pattern of how the fight was going to be mainly fought. While on the ropes, Davis pounded away at Bobo’s midsection and head, landing left-right combinations repeatedly. Bobo, however, was able to land some clean left hands, showing his superior speed and foot movement, during the brief moments that he was able to get off the ropes and take the fight to the center of the ring. At the rounds end, Davis had a small cut on the right side of his cheek. In rounds two through four, Davis continued attacking Bobo and backing him up to the ropes, where Davis would unleash a sustained body and head attack. Bobo spent a lot of time clinching during these rounds, which caused the referee George Chip to give him a stern warning about it. At times, when he was in the center of the ring, Bobo looked very impressive, showing smooth ring movement and blistering fast left hands, which seemed to indicate that he had more power than his knockout report showed. Yet, he was only able to sustain these moments for a brief amount of time, since when Davis would come forward in his direction, Bobo would back away in a direct straight line, retreating to the ropes where Davis would resume pounding away at him. Bobo was deducted a point for excessive holding by the referee, though it didn’t appear that he was holding all that much. Davis clearly won the first four rounds, but he was getting hit cleanly at times by Bobo and showing terrible defense. In the fifth round, Bobo looked badly drained as the round started, with swelling underneath both of his eyes. Davis, sensing that Bobo was exhausted and ready to go, he really began to pour it on, as he rained punches on him as Bobo helplessly tried to cover up. While Bobo was getting pounded against the ropes, Davis pushed him through the ropes, and the referee counted it as a knockdown. Later on in the round, Bobo fell down while trying to hold onto Davis, and again the referee called it a knockdown. Shortly thereafter, a point was deducted from Bobo for excessive clinching, the 2nd time he had a point deducted for holding during the fight. However, he was able to make it out of the round without being pushed or otherwise knocked down again. In between rounds, Bobo stood resting against the ropes, not sitting down, and having a discussion with his corner man. Finally after a short period, Bobo shook his head, as if to say, he didn’t want to fight at longer. The referee quickly moved in and after speaking to Bobo’s corner people, the fight was stopped in between rounds. From appearances, Bobo seemed as if he wasn’t ready to take on a veteran as tough and schooled as Davis. Though he was unbeaten and had showed exceptional skills in previous bouts, Bobo seemed confused, not knowing what to do with Davis’ mauling tactics. « Wladimir Klitschko vs. Evander Holyfield or Corrie Sanders?